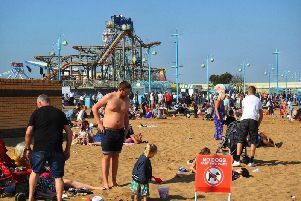 A grading scheme that assesses accommodation and helps visitors choose the best places to stay in the Skegness area has won a Taste of Excellence award. Rest Assured, launched by the Skegness and East Coast Hospitality Association (SECWHA), won the Lincolnshire Life Best New Business award at a glittering ceremony at the Oaklands Hall Hotel in Laceby. Another member,The Vine hotel, received gold accreditation the Accommodation category, Wedding Venue of the Year category and Restaurant of the Year. June Howard, business development manager said: “We are absolutely thrilled with this award. It was so unexpected. Everyone has worked really hard to develop this scheme. Bill Hutchinson, chairman, said: “In this day and age, there is great emphasis on social media and website reviews. Whilst that is important, it is subjective. “Visitors want reassurance that the place they choose to stay lives up to their expectations. Unless they have stayed before, they are making a choice based on trust. This scheme helps visitors choose the right place to stay with confidence.”.